UDM Downloads > DWG TO PDF Converter! 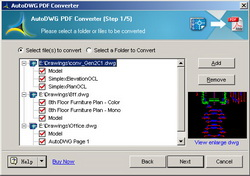 AutoDWG DWG to PDF Converter TTF version allows you to batch convert DWG, DXF and DWF to PDF which is easy-to-use. Supports AutoCAD 2010 now. Runs outside of AutoCAD as a standalone program (AutoCAD not required). Features include: 1. Create a single merged PDF file from several DWG files or create an individual PDF file for each DWG file selected; 2. Both model space and paper space are supported; 3. Create searchable Truetype Texts in PDF; 4. Add print, copy, modify permissions to converted PDF; 5. Convert drawings into monocolor or color; 6. Multiple choice of output paper size; 7. Supports versions of DWG/DXF files R2.5 to 2010 formats and all versions of DWF files; 8. Supports advanced bookmark, create bookmark automatically using layout name and file name; 9. CTB file supported or use CAD default line weight to convert; 10. PDF background is changable; 11. The "pro" version allows customize pdf watermark; 12. Layers selection is supported, let you turn on or turn off each layer, and the settings could be different to each layouts, or set specific layers turned off to all the drawings. 13. The software is trying to be ease of use to the starters, and power of features to the experts. Keywords: dwg to pdf, search TTF, Truetype texts, dwg to pdf converter, convert dwg to pdf, pdf converter, dwg pdf, convert to pdf, convert pdf, convert, free dwg to pdf, dwg to dxf.